As much as I like a weekend away, there are just as many adventures to be closer to home. 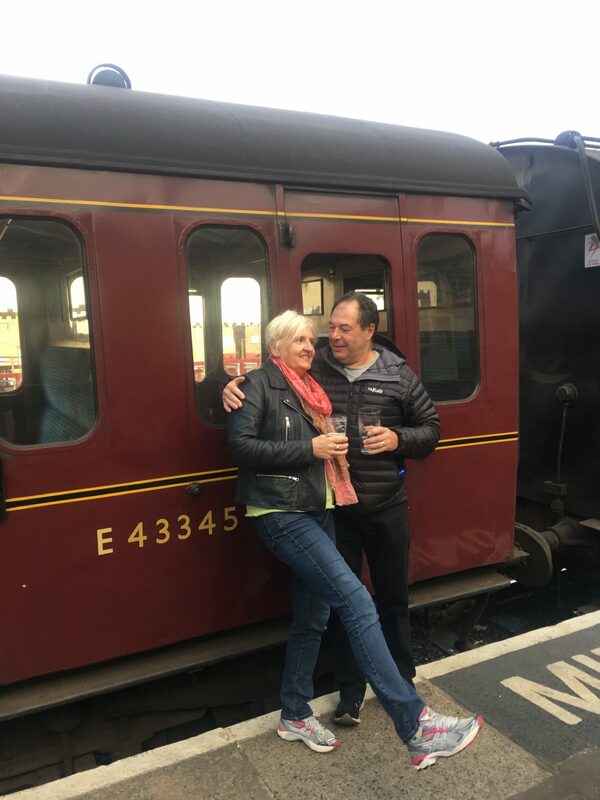 Sunday morning arrived and we looked up train times only to discover that our timing was perfect and coincided with the KWVR beer festival… none of us were going to say no to that! We made our way to Keighley train station and purchased our KWVR Rover tickets (these allow you to travel back and forth along the line as much as you want for the day for £18) and 6 beer tokens each (1 token = half a pint and costs £1.80 per token or 6 for £10). 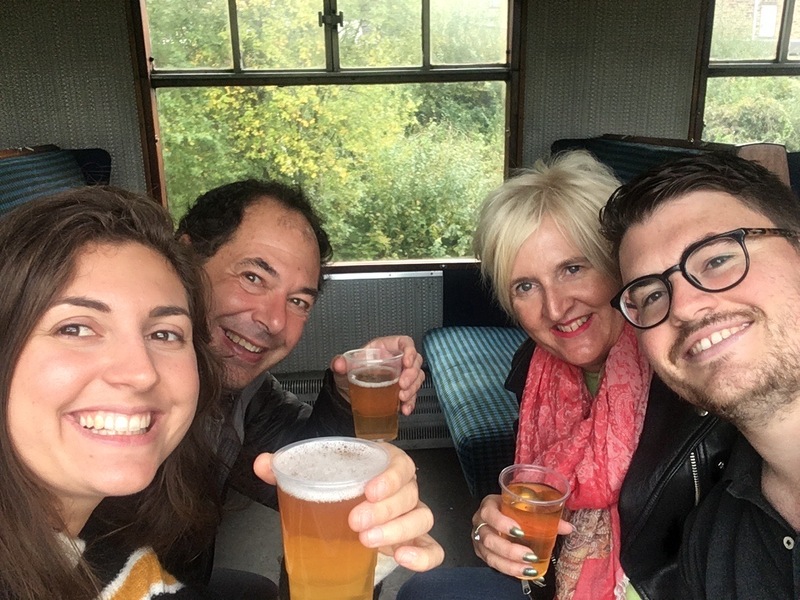 We boarded the beautiful steam train and headed to the on-board bar for half a pint each of Kirkstall Three Swords Extra Pale Ale – a perfect drink to enjoy whilst trundling through the countryside to Oxenhope. We arrived at Oxenhope and disembarked the train, spending a few minutes watching with wonder as the engine was detached from the rest of the train and passed alongside it before it could begin the journey back. Then… time for the next beer! We headed into the main beer festival, held in the exhibition shed at the station. At this point we encountered a major issue… which beer to try first?! As it was the final day of the festival, most of my first choices had sold out including an unusual sounding rum & raisin cider, a lemon sherbet beer and an iced latte stout that I was drying to try. Nonetheless, we made our way through several fantastic beers each and I honestly didn’t find one that I didn’t enjoy (maybe that says something about me?!). 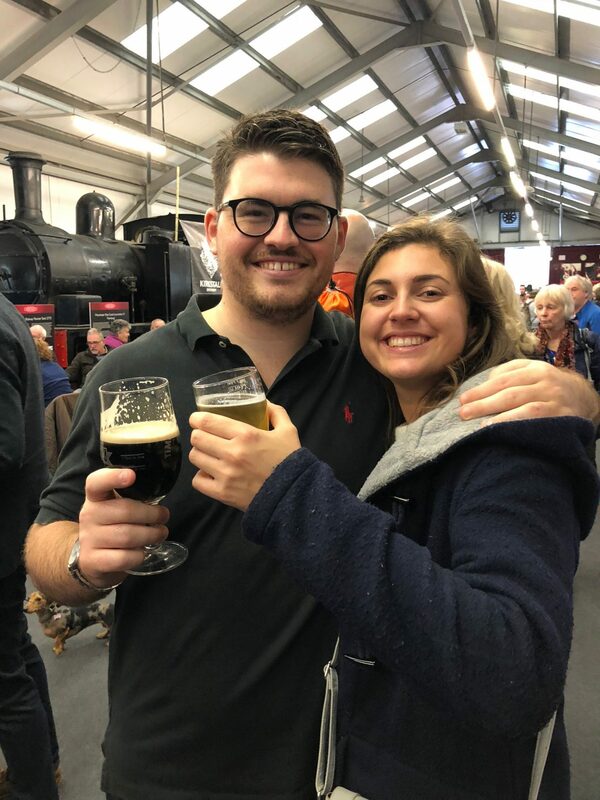 We enjoyed some live music and soaked up our first few beers with some (AMAZING) pork scratchings before hopping back onto the steam train, bypassing our original destination of Haworth (not enough beer there) and arriving at the next destination on our beer tour, Ingrow. 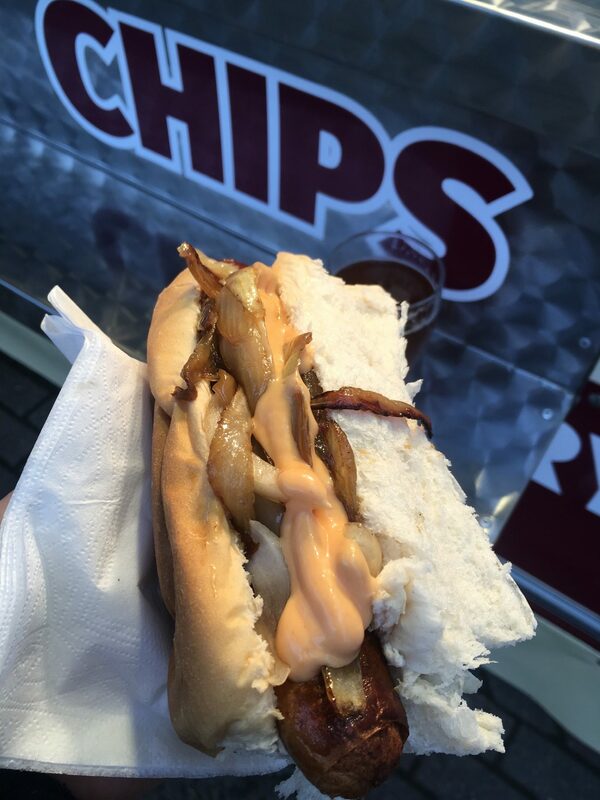 Although a much smaller venue, we enjoyed a further couple of beers (including a Raspberry Brûlée beer by Wishbone Brewery which was a highlight for me), some more live music and a much needed hotdog complete with fried onions. Don’t judge me on putting burger sauce on a hotdog. Exhausted from a hard day of beer drinking and decision making (there were well over 200 beers and ciders to choose from) we called it a day and headed home. 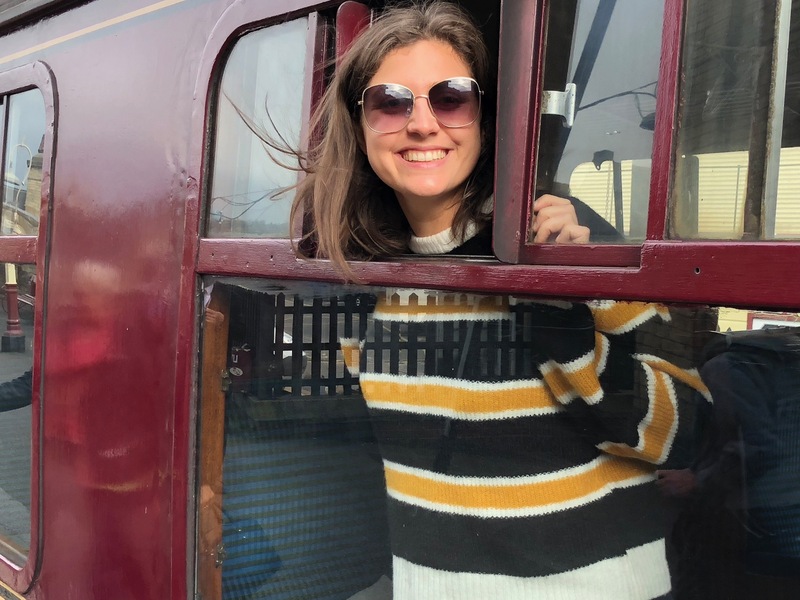 This is definitely an event I’ll be visiting again next year – if you like beer, cider or trains (or dogs, there were so many cute ones there!!) you should too. If you any more information on the KWVR have a look here – it really is a great day out, especially for families. Anyone else been to a good beer festival this year, or one with a difference like this? Would love to hear where you’ve been and the weirdest beers you’ve tried! P.S. I’ve had some issues with the subscription form at the bottom of my homepage, so if you’ve tried to subscribe but haven’t received an email please let me know and I’ll add you manually. Sorry about this, still getting the hang of this technology stuff!